View More In Underwater Lighting. This underwater diving light is designed for GoPro Hero 4/3+/3/2 and Xiaomi yi /SJ4000/SJ5000 Action Camera. Waterproof housing cover and shell lock makes this LED light an excellent waterproof effect,up to 30m(100FT). You can enjoy a pleasant underwater taking photos experience with this waterproof light and cameras. such as climbing,hiking,camping,running,riding,cycling at night and other outdoor activities. 3 lighting modes:High light(normal)-2.5Hours,Low(power saving)-8Hours,SOS(flash)-12hours. The diving light can be used with the headband,chest strap,bicycle brackets and motorcycle brackets. Lightweight and small volume,you can carry it everywhere you like. Comes with 2 rechargeable batteries,you can charge it with USB port. 1000mAh large capacity,you do not have to charge it frequently. The wide angle beam makes sure that the entire camera field of vision has proper lighting. Extra-long life,energy-saving,low-power,durable material and environmental. Waterproof up to 30m(100FT),BUT it is not recommended to use this diving light under 30m underwater. Please note: Camera is not included! For Xiaomi Yi and other action cameras,they need another conversion adapter to mount on those accessories. (conversion adapter is NOT included in this accessories kit). The Underwater diving light is perfect for GoPro Hero 4/3+/3/2 and Xiaomi yi /SJ4000/SJ5000 Action Camera.Wide angle beam,you can take amazing photos with this light in underwater world. 3 lighting modes:3 modes of the video light for Gopro Hero cameras can be choosed:HI-LOW-SOS,1000MA battery running time is 2.5H for High Light(normal),8H for LOW(power saving),12H for SOS(flash). 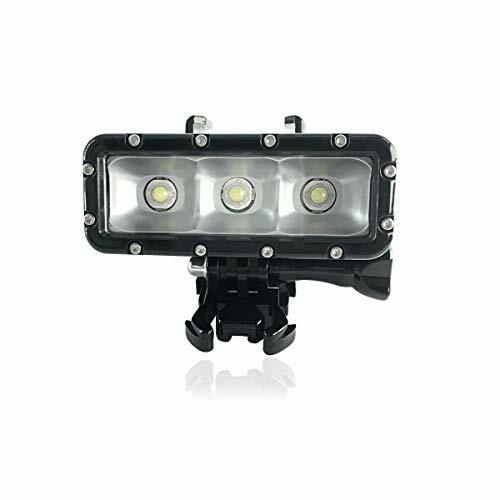 Easy to install and use:it is easy to install the camera to the this diving light according to instruction.The diving light can be used with the headband and chest strap,lightweight and small volume,very convenient to carry and use. Rechargeable batteries:this diving light for Gopro comes with 2 rechargeable Lithium Batteries(each:3.89Wh,1050mAh),after batteries are full charged with USB port,they will last long time.3 LEDs,the diving light is very bright.Please do not straight look to the LED light when the light is on. If you have any questions about this product by Anordsem, contact us by completing and submitting the form below. If you are looking for a specif part number, please include it with your message.